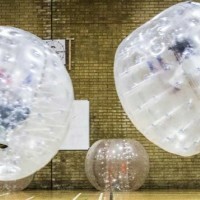 A relative newcomer, zorb football is becoming increasingly popular. It's kind of a combination of its a knockout and 5 or 6 a side football - you can just imagine what a laugh that would be. A relative newcomer to the activity market, zorb football is becoming an increasingly popular choice of activity with anyone wanting a fun hilarious activity. Zorb football is a kind of combination of its a knockout and 5 or 6 a side football, you can just imagine what a laugh that would be. With the normal aim of getting the ball into the back of the net, you will also be dressed up in an inflatable ball. With the inevitable consequences of bouncing off your team mates and opponents, falling over and rolling around the pitch, getting up might be a problem with a combination of being slightly encumbered, laughing hysterically and your mates pushing you back down! A great laugh and fantastic exercise, zorb football can be combined with almost any other activity for a day or weekend of fun. Let us package that all up for you and roll it into something you will remember for a long time to come.